Use Our Stamp Design Wizard! Self-Inked Stamps are stamps that have a "flip" down motion to make an impression. These type of stamps will use a water based ink.​ Shiny Supreme Ink. Pre-inked Stamps are stamps that when pressed, "Kiss" the paper and make minimal noise because of less travel. 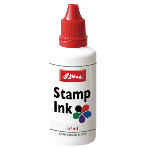 These stamps will always use an "Oil" based ink such as Shiny, Maxlight, I-stamp or x-stamper ​brand. Shiny Supreme & Eminent are premium inks and always ensure clean, crisp, clear quality impressions. Notice: Using the wrong type of ink can ruin your stamp. 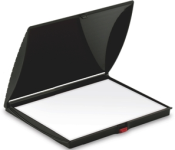 Click on Stamp Pads to choose the right size pad for your stamps. The Stamp pad sizes come in #00, #0, #1, #2, #3, #4, and the large heavy duty industrial pad. We have the right size pad for you.